1. Find your order under ‘Awaiting Payment’ list, select the order you want to pay then ‘proceed to checkout’. Please notice that only when the order passes review can you proceed to checkout. 2. Click ‘Proforma Invoice’, then you will go to the correct webpage to download the invoice. Please download the suitable invoice you want according to the different payment methods. There are 2 cases if you want to get the invoice after payment done. 1. You want to get the invoice after payment done but order is still in production status. click ‘invoice’ to get the invoice download. There is a little different from previous method, there is no ‘Download’ button now, only ‘Print’ button exists, then just click ‘Print’ to get the invoice. 2. 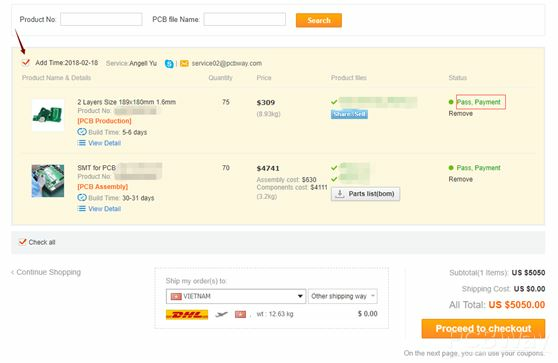 You want to get the invoice after order completed, even you have received the boards. Then please find the order under ‘Completed’ list, use same way as above to get the invoice. How do I place an order on pcbway? Can I change anything for repeat order? If I have several accounts, could I combine orders which are in different accounts? Could I make repeat order in different account,such as the order is in account A, but I want to do repeat order in account B?